Being pregnant can be stressful. It is a time of great change within a woman’s body, when expectant mothers often strive to make healthy decisions to give their unborn child the best chance to grow and develop normally. There may be diet changes, and sleep is inevitably given careful consideration. What are the consequences of lack of sleep during pregnancy? Learn about the effects of poor sleep on an expectant mother, the pregnancy itself, and the developing fetus. 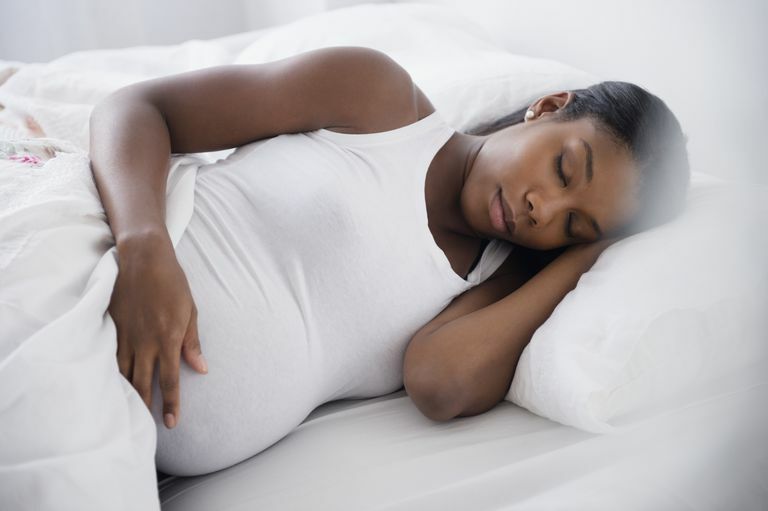 Poor sleep can adversely affect health, and it also has a critical impact on pregnant women, potentially leading to maternal complications such as hypertension and gestational diabetes. What contributes to this relationship? High blood pressure in pregnancy is present when blood pressure is measured to be greater than 140/90 mm Hg on repeated occasions after 20 weeks of gestation in women without prior hypertension. If protein is also noted in the urine, the condition called preeclampsia may occur, which is associated with potential organ injury in the mother. Preeclampsia increases the risk of death for both mother and child. A number of findings are associated with preeclampsia. It commonly occurs in the setting of chronic snoring, with about 59% of preeclamptic women snoring habitually. This may contribute to swelling along the airway, which in turn narrows the passage through which air must flow. Women who gain too much weight or who have a large neck circumference may be at additional risk. These factors contribute to the collapse of the airway and to difficulty breathing during sleep. These pauses in breathing, called apnea, may be associated with surges in blood pressure. These surges can lead to changes in the blood vessels and increase overall blood pressure. This may reduce the blood volume pumped by the heart, a reduction in cardiac output. As a result, blood flow to the fetus via the placenta can be compromised. With inadequate blood flow to the developing baby, there can be drops in oxygen levels. This may contribute to growth restriction of the developing fetus, and poor pregnancy outcomes. In addition, chronic partial sleep loss may increase the risk of developing obesity and diabetes. This is due to changes in the regulation of glucose and control of appetite. With the presence of habitual snoring, there is an increased risk of developing gestational diabetes. Moderate sleep apnea, with at least 15 disruptions to breathing per hour of sleep, as well as long naps, is associated with higher glucose levels. The developing fetus needs a reliable supply of nutrients, including oxygen. When sleep is disrupted, especially when blood flow to the placenta is compromised, there can be significant consequences. Insufficient total sleep, or fragmentation of deep sleep, may reduce the amount of growth hormone released. This may lead to developmental or growth problems in the unborn baby. It is well-understood that even minor declines in the oxygen levels of the mother may endanger the fetus. When the mother’s blood oxygen falls, the fetus reacts with decelerations of the heart rhythm and acidosis. Blood flow to the fetus is at its peak during sleep, and oxygen levels that drop during sleep as a result of sleep apnea will have a major impact. Clearly, snoring and sleep apnea will increase the risk of problems during pregnancy. Additional health problems, such as obesity, diabetes, asthma, and smoking, will make these difficulties worse. As a result, there is an increased risk of premature delivery, growth restriction, and potential for health problems in, or death of, the newborn infant. Studies have shown that women in the third trimester who sleep fewer than 6 hours per night had longer labor and 4.5 times higher rates of cesarean section compared to those who got 7 hours of sleep or more. There may be a higher perception of pain in those who sleep less. Sleep deprivation may also interfere with the normal progression of labor. Inadequate quality or quantity of sleep may undermine a mother’s daytime function and mood, possibly resulting in problems with attention, concentration, and memory. Higher incidences of depression may also result. These issues may affect communication and social interactions. For many women, these issues may persist into the first few weeks after delivery, especially because the child’s nighttime feedings may continue the fragmentation of sleep. Studies have shown the women with preeclampsia have poor sleep quality with an increase in slow-wave sleep and a decrease in rapid eye movement (REM) sleep. In addition, they take naps more frequently. Fortunately, the use of continuous positive airway pressure (CPAP) can improve blood pressure and oxygenation to the fetus. This may allow the pregnancy to progress further, leading to normal birth weight and improving outcomes for the infant at delivery. Almost all women, especially those who are overweight or obese, have sleep problems at some point during pregnancy. Most of the stress is related to uncertainty about whether the problems are normal or not. If you are concerned about whether your sleep difficulties may affect your developing child, speak with your doctor. It can be helpful to review your sleep habits and factors that may contribute to sleep loss. Early diagnosis and treatment of underlying sleep problems will make the pregnancy more tolerable and lead to better outcomes for your baby. This will ultimately lead to a more favorable transition from pregnancy to early motherhood. Kryger, MH et al. "Principles and Practice of Sleep Medicine." ExpertConsult, 5th Edition, 2011, pp. 1582-1584.